The old Royal Greenwich Observatory building, now known as Flamsteed House. 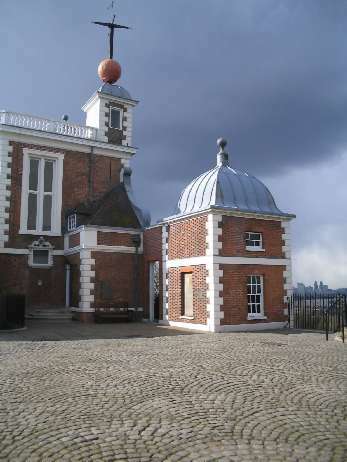 The Royal Greenwich Observatory, until its closure in 1998, was the oldest scientific institution in Britain. It was founded in 1675 by decree of Charles II. The first Astronomer Royal, John Flamsteed, was charged "to apply himself with the most exact care and diligence to the rectifying of the tables of the motions of the heavens, and the places of the fixed stars, so as to find out the so much desired longitude of places for the perfecting of the art of navigation." Other famous directors have included Edmond Halley and George Airy. The RGO was first sited at Greenwich, southeast London, on what became known as the Greenwich meridian (the international zero of longitude). The original Greenwich building, now known as Flamsteed House and run as an astronomical museum, was designed by Christopher Wren. In 1958 the Observatory moved to the castle at Herstmonceux, Sussex. From the outset, directorship of the Observatory entailed appointment as Astronomer Royal. In its 323-year history, the RGO maintained a tradition of high-precision astrometry of planets and satellites and was always at the forefront of technology and observational techniques. In the 1980s the Observatory lost its primary national status with the completion of the Northern Hemisphere Observatory in Las Palmas, the Canary Islands. In 1990 the RGO moved again, to Cambridge, before being closed on October 31, 1998, by the UK Particle Physics and Astronomy Research Council. The bright red Time Ball on top of Flamsteed House (the original RGO building) is one of the world's earliest public time signals, distributing time to ships on the Thames and many Londoners. It was first used in 1833 and still operates today.